Stay on top of outstanding invoices, send statements and register payments. A user with Finance access can manage billing and collection for all client accounts. Manage delinquent payers, outstanding invoices and register payments linked to the invoices so that the entire team stay up-to-date. Go to Finance >>> Collection. In here you can find various tabs that contain selections of invoices. The purpose of these tabs is to quickly give the user access to specific invoices based on filters and then show columns of data and tools that are typically needed for managing the selection of invoices. This tab is used if you want display the status of specific client accounts. All outstanding invoices for the client account will be displayed here. You can click the small + sign to show who the main contacts at the account is. You can easily send out reminders by ticking off the checkbox and then click the Send statement button on the lower left. This is used if you want to check the status of invoices related to specific issues or products. In the column named Row description you can make a selection. As RunMags allow you to batch-send invoices with a click of a button, this tab helps you manage those batches in case you need to re-send the invoices in a certain batch. Simply select the batch you want to resend. Click the Resend batch button if you want to email the invoices. Click the Reprint batch button if you want to send the invoices by mail. This tab is used if you want to display all invoices regardless of status and apply specific filters to search for specific ones. 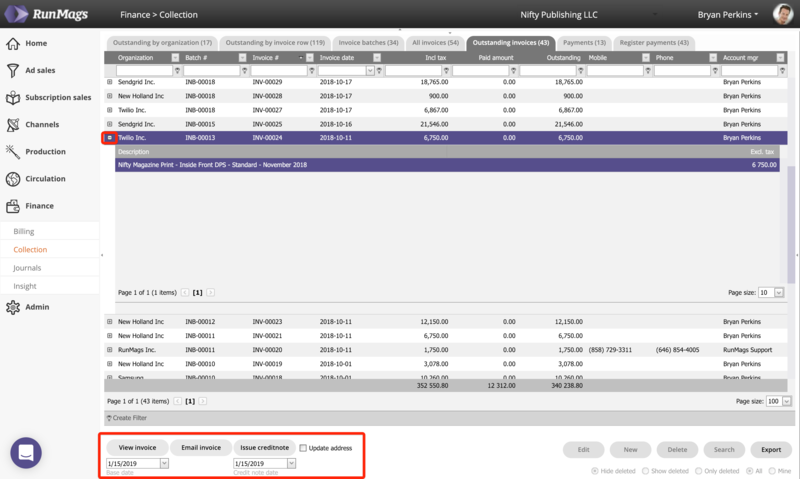 This tab is used if you want to display all outstanding invoices and apply specific filters to search for specific ones. You can click the + sign to display what the invoice relates to and in the data columns you can also find contact information if it has been entered. Using the buttons on the lower left you can display the invoice, email it once again to the client or issue a credit note in case there's an error on the invoice. This tab is used to display payments that have been recorded in the system. The process for registering payments is covered in this article.